In an electric power system, switchgear is the combination of electrical disconnect switches, fuses or circuit breakers used to control, protect and isolate electrical equipment. 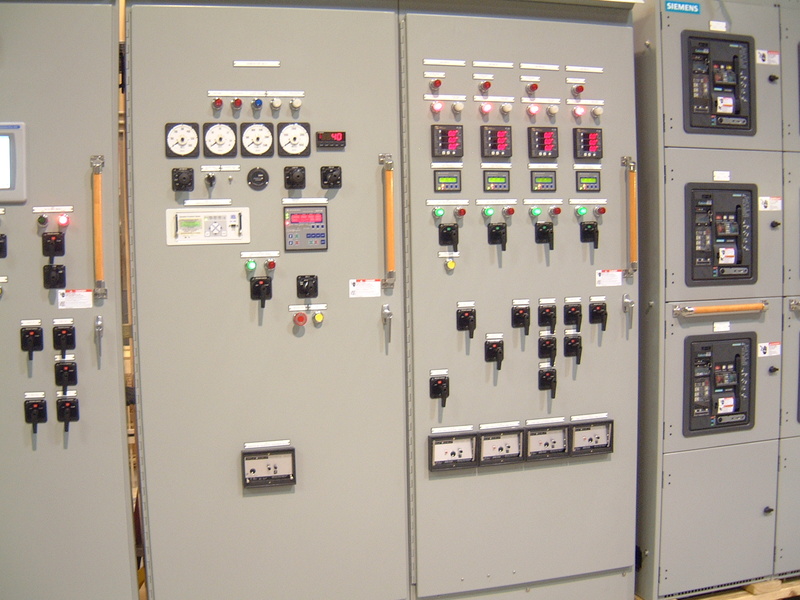 Switchgear is used both to de-energize equipment to allow work to be done and to clear faults downstream. This type of equipment is directly linked to the reliability of the electricity supply. The very earliest central power stations used simple open knife switch, mounted on insulating panels of marble or asbestos. Power levels and voltages rapidly escalated, making opening manually operated switches too dangerous for anything other than isolation of a de-energized circuit. Oil-filled equipment allowed arc energy to be contained and safely controlled. By the early 20th century, a switchgear line-up would be a metal-enclosed structure with electrically operated switching elements, using oil circuit breakers. Today, oil-filled equipment has largely been replaced by air-blast, vacuum, or SF6 equipment, allowing large currents and power levels to be safely controlled by automatic equipment. High-voltage switchgear was invented at the end of the 19th century for operating motors and other electric machines. The technology has been improved over time and can now be used with voltages up to 1,100 kV. 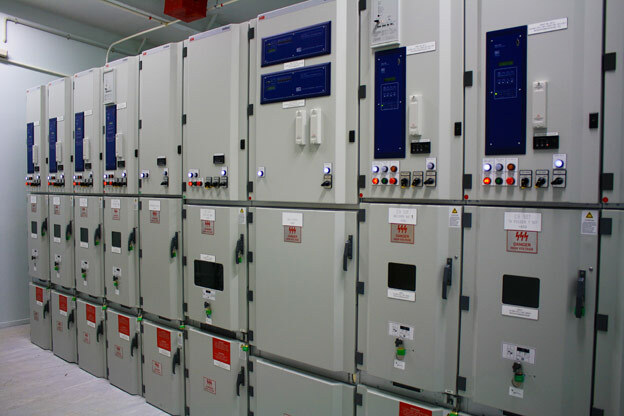 Typically, switchgears in substations are located on both the high- and low-voltage sides of large power transformers. The switchgear on the low-voltage side of the transformers may be located in a building, with medium-voltage circuit breakers for distribution circuits, along with metering, control, and protection equipment. For industrial applications, a transformer and switchgear line-up may be combined in one housing, called a unitized substation (USS). A switchgear may be a simple open-air isolator switch or it may be insulated by some other substance. An effective although more costly form of switchgear is the gas-insulated switchgear (GIS), where the conductors and contacts are insulated by pressurized sulfur hexafluoride gas (SF6). Other common types are oil or vacuum insulated switchgear. Oil circuit breakers rely upon vaporization of some of the oil to blast a jet of oil along the path of the arc. The vapor released by the arcing consists of hydrogen gas. Mineral oil has better insulating property than air. Whenever there is a separation of current carrying contacts in the oil, the arc in circuit breaker is initialized at the moment of separation of contacts, and due to this arc the oil is vaporized and decomposed in mostly hydrogen gas and ultimately creates a hydrogen bubble around the electric arc. This highly compressed gas bubble around the arc prevents re-striking of the arc after current reaches zero crossing of the cycle. The oil circuit breaker is the one of the oldest type of circuit breakers. Air circuit breakers may use compressed air (puff) or the magnetic force of the arc itself to elongate the arc. As the length of the sustainable arc is dependent on the available voltage, the elongated arc will eventually exhaust itself. Alternatively, the contacts are rapidly swung into a small sealed chamber, the escaping of the displaced air thus blowing out the arc. Circuit breakers are usually able to terminate all current flow very quickly: typically between 30 ms and 150 ms depending upon the age and construction of the device. Gas (SF6) circuit breakers sometimes stretch the arc using a magnetic field, and then rely upon the dielectric strength of the SF6 gas to quench the stretched arc. Hybrid switchgear is a type which combines the components of traditional air-insulated switchgear (AIS) and SF6 gas-insulated switchgear (GIS) technologies. It is characterized by a compact and modular design, which encompasses several different functions in one module. Circuit breakers with vacuum interrupters have minimal arcing characteristics (as there is nothing to ionize other than the contact material), so the arc quenches when it is stretched by a small amount (< 2–8 mm ). Near zero current the arc is not hot enough to maintain a plasma, and current ceases; the gap can then withstand the rise of voltage. Vacuum circuit breakers are frequently used in modern medium-voltage switchgear to 40,500 volts. Unlike the other types, they are inherently unsuitable for interrupting DC faults. The reason vacuum circuit breakers are unsuitable for breaking high DC voltages is that with DC there is no "current zero" period. The plasma arc can feed itself by continuing to gasify the contact material. Breakers that use carbon dioxide as the insulating and arc extinguishing medium work on the same principles as a sulfur hexafluoride (SF6) breaker. Because SF6 is a greenhouse gas more potent than CO2, by switching from SF6 to CO2 it is possible to reduce the greenhouse gas emissions by 10 tons during the product lifecycle. Metal-enclosed (ME) — A switchgear assembly completely enclosed on all sides and the top with sheet metal. Metal-clad (MC) — A metal-enclosed switchgear featuring the main switching and interrupting device of removable type; grounded metal barriers to separate compartments and enclose all major circuits and parts; mechanical interlocks; insulated bus conductors and other features. A single line-up may incorporate several different types of devices, for example, air-insulated bus, vacuum circuit breakers, and manually operated switches may all exist in the same row of cubicles. 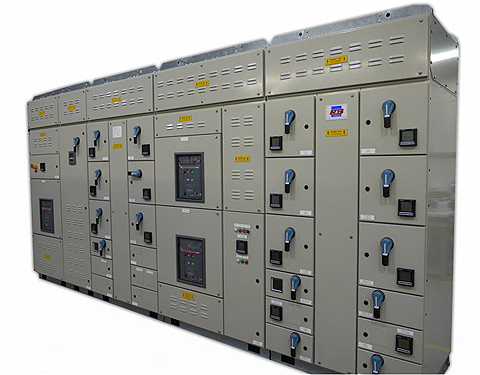 Ratings, design, specifications and details of switchgear are set by a multitude of standards. In North America mostly IEEE and ANSI standards are used, much of the rest of the world uses IEC standards, sometimes with local national derivatives or variations. To help ensure safe operation sequences of switchgear, trapped key interlocking provides predefined scenarios of operation. For example, if only one of two sources of supply are permitted to be connected at a given time, the interlock scheme may require that the first switch must be opened to release a key that will allow closing the second switch. Complex schemes are possible. Indoor switchgear can also be type tested for internal arc containment (e.g., IEC 62271-200). This test is important for user safety as modern switchgear is capable of switching large currents. Switchgear is often inspected using thermal imaging to assess the state of the system and predict failures before they occur. Other methods include partial discharge (PD) testing, using either fixed or portable testers, and acoustic emission testing using surface-mounted transducers (for oil equipment) or ultrasonic detectors used in outdoor switchyards. Temperature sensors fitted to cables to the switchgear can permanently monitor temperature build-up. SF6 equipment is invariably fitted with alarms and interlocks to warn of loss of pressure, and to prevent operation if the pressure falls too low. The increasing awareness of dangers associated with high fault levels has resulted in network operators specifying closed-door operations for earth switches and racking breakers. Many European power companies have banned operators from switch rooms while operating. Remote racking systems are available which allow an operator to rack switchgear from a remote location without the need to wear a protective arc flash hazard suit.